In front of over 50,000 fans at Cowboys Stadium in Arlington, TX, WBO welterweight champion Manny Pacquiao retained his title with a decision against Joshua Clottey last night. 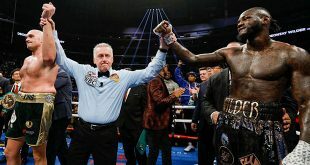 But it wasn't an easy task as the defensively excellent former IBF welter king Clottey largely prevented the southpaw champion from launching the type of sustained attacks that took the WBO title from Miguel Cotto last November. Instead, as Clottey protected his head, Pacquiao concentrated much of his efforts on the body of the challenger, which at times clearly affected the rugged welter from Ghana. Clottey had success with the jab on occasion but had his best moments with an effective uppercut although the 32 year old Bronx resident was never busy enough to outwork Pacquiao, of General Santos City, The Philippines. 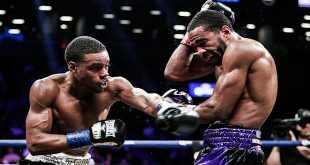 During the times Clottey started to gain momentum, Pacquiao would contain the outbreak by raising his punch output to force the challenger back into a defensive shell. In the later rounds, the punishment Clottey had absorbed to that point began to take its toll as the challenger looked to be weakening from Pacquiao's continued attention to the midsection. Clottey did manage to survive the twelfth and final frame only to lose by the wide point margins of 120-108 and 119-109 twice on the scorecards. Pacquiao sees his record to 50-3-2 (38) and could either face the winner of the upcoming Shane Mosley vs. Floyd Mayweather Jr clash or retire to purse a career in politics. Clottey drops to 35-4 (20). 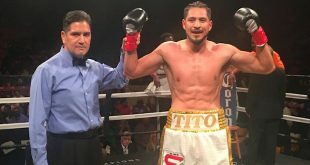 The undercard featured a clash for the vacant WBC lightweight title as former beltholder David Diaz, 35-3-1 (17), hit the canvas and lost on points 117-109 twice and 115-111 to ex-WBC super feather ruler Humberto Soto, 51-7-2 (32). It looks like the end of the road for former two time WBC lightweight champ Jose Luis Castillo, 60-10-1 (52), who did not answer the bell for the sixth round against Alfonso Gomez, 22-4-2 (11), at welterweight. Irish middleweight John Duddy, 29-1 (18), managed a split decision victory against light middleweight Michael Medina, 23-2-2 (18), by scores of 96-93 twice and 93-96.